This could not be a better time to buy!! This charming new home community is surrounded by conservation areas and ponds just 25 miles west of Orlando. 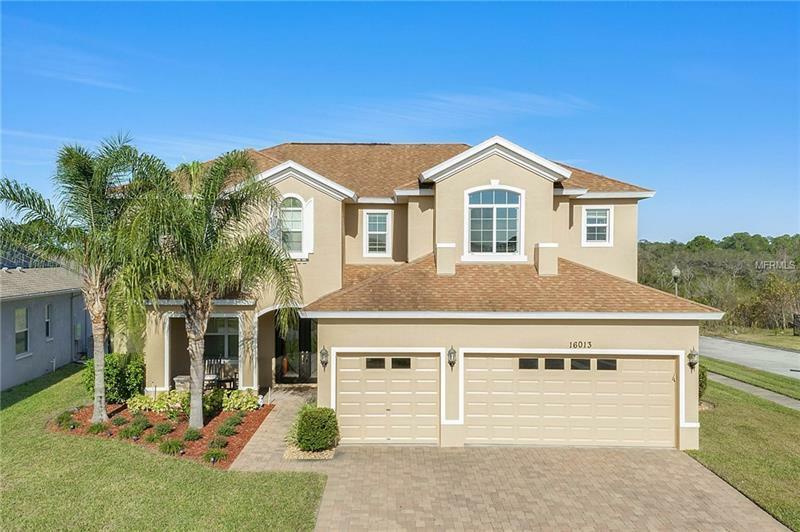 This home has been meticulously maintained and offerâs a spectacular view of the conservation with sensational sunrises from the rear balcony as well as nightly Disney fireworks! The E-Bonus model is the largest built by Home Dynamics. It offers a fantastic floor plan for a growing family with 5 bedrooms, 4 bathrooms, 3 car garage, and TWO Master Suites that could be perfect for the in-laws. Upstairs you will find a full movie theatre complete with a 100â screen, astounding surround sound, and lounge seating. The Sawgrass Bay community offers a large resort style pool, nature trails, playground and a dog walking park. The community will soon connect directly to Orange County and the 429 that is going to be called the Lake-Orange connector which will be a very short drive to Walt Disney World and Universal Studios theme parks. Just north of the community is going to be the new home to the Olympus Wellness-Way project which will include multi-sport training and competition venues; leading-edge wellness, health and fitness facilities and a village that features sports-themed, world-class hotels, restaurants, shops, entertainment and residences. Donât let the opportunity pass you by!! Set up your private tour of this home today! !